Drawn to the Loadstone Rock A Tale of Two Cities Book 2 Chapter 24. 2 Significance:“The Loadstone Rock”  “Like the mariner in the old story, the winds and streams had driven him within the influence of the Loadstone Rock, and it was drawing him to itself…”  The “old story” referred to here is 1001 Arabian Nights, in which there is a tale about a ship that was attracted to a magnetic rock, which caused its destruction.  The allusion to the Loadstone Rock foreshadows a ‘shipwreck’ among the ‘seas’ of revolution that are to come.  In this chapter, Charles Darnay’s “Loadstone Rock” is his own sense of what is right and a need to fulfill his obligations. 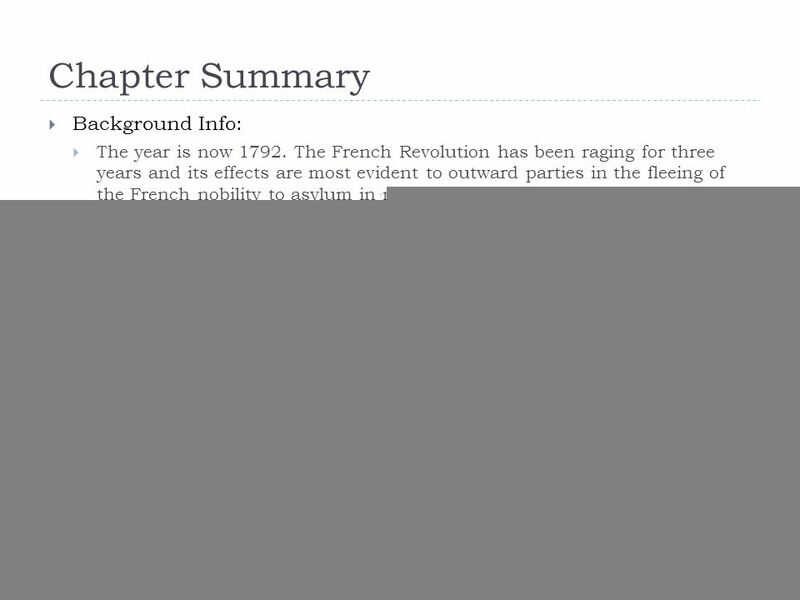 3 Chapter Summary  Background Info:  The year is now 1792. The French Revolution has been raging for three years and its effects are most evident to outward parties in the fleeing of the French nobility to asylum in neighboring countries. The monarchy has been abolished.  In England, surrounding Tellson’s Bank and Co., many French aristocrats gather together to gain insight into the current condition of France.  Inside the bank Charles Darnay is trying to dissuade Lorry from traveling to France with Jerry Cruncher to retrieve legal documents from the Paris branch of Tellson’s bank. Lorry is planning to leave that night.  Their conversation is interrupted when Lorry receives a letter addressed to the “Marquis St. Evremonde” (Charles Darnay’s birth name), whom nobody in the bank knows personally, but who is considered a coward by nearly all parties present, including the always detestable Shryver. Darnay manages to keep calm, although he is insulted, and instead offers to deliver the message to the Marquis himself. 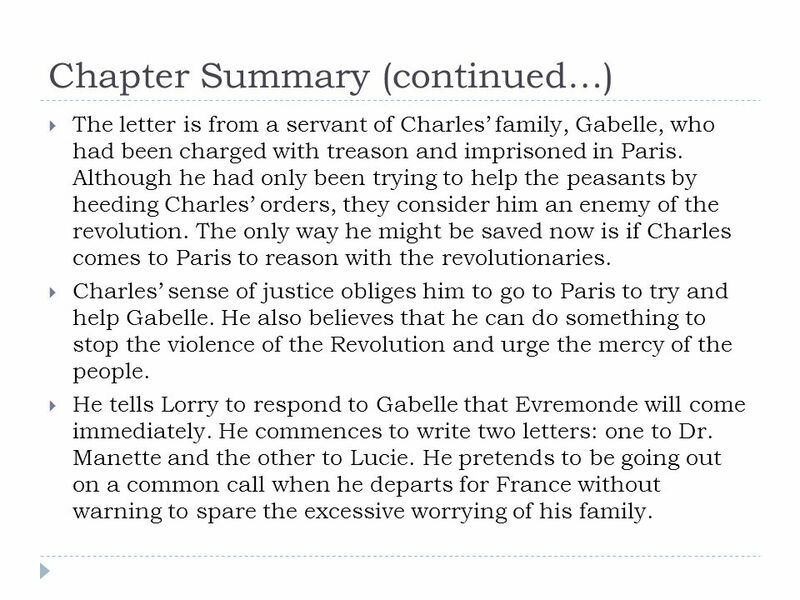 4 Chapter Summary (continued…)  The letter is from a servant of Charles’ family, Gabelle, who had been charged with treason and imprisoned in Paris. Although he had only been trying to help the peasants by heeding Charles’ orders, they consider him an enemy of the revolution. The only way he might be saved now is if Charles comes to Paris to reason with the revolutionaries.  Charles’ sense of justice obliges him to go to Paris to try and help Gabelle. He also believes that he can do something to stop the violence of the Revolution and urge the mercy of the people.  He tells Lorry to respond to Gabelle that Evremonde will come immediately. He commences to write two letters: one to Dr. Manette and the other to Lucie. He pretends to be going out on a common call when he departs for France without warning to spare the excessive worrying of his family. 5 Lit Devices  “Monseigneur, as a class, had dissociated himself from the phenomenon of his not being appreciated: of his being so little wanted in France, as to incur considerable danger of receiving his dismissal from it, and this life together.”  Synecdoche, Understatement, Irony Dickens uses blatant sarcasm to draw attention to the obvious fact that French aristocrats are hated and therefore have a need to flee the country while they still retain their wealth, influence, and vitality. Using the title ‘Monseigneur’ to describe all members of the French aristocracy is ironic. It calls attention to the fact that aristocrats have lost their position as ‘lords’ over plebeians, and shows that the title is only referred to now in a mocking way.  “Yes. The Loadstone Rock was drawing him, and he must sail on, until he struck. 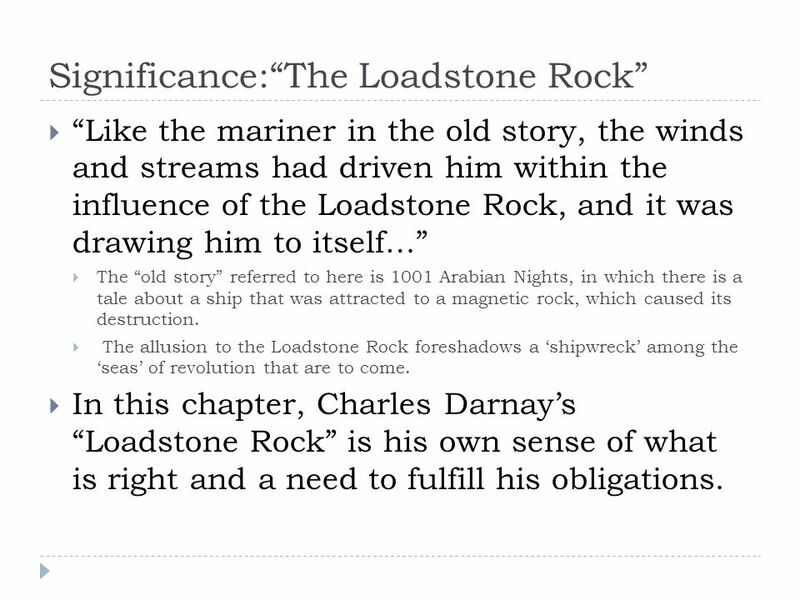 He knew of no rock; he saw hardly any danger.”  Symbolism, Dramatic Irony The Loadstone Rock symbolizes Darnay’s sense of guilt and his quest for atonement. Dickens makes the reader aware of these feelings that are driving Darnay’s recent actions, yet they are unaware to Darnay himself. Darnay is also unaware of the fact that his going back to France will inevitably draw Lucie and Dr. Manette into the turmoil of the Revolution. 6 Lit Devices (continued…)  “Like the fabled rustic who raised the Devil with infinite pains, and was so terrified at the sight of him that he could ask the Enemy no question, but immediately fled; so, Monseigneur, after boldly reading the Lord’s prayer backwards for a great number of years, and performing many other potent spells for compelling the Evil One, no sooner beheld him in his terrors than he took to his noble heels.”  Extended metaphor, Allusion, Symbolism In this context, the ‘rustic’ is the French elite. The overtaxation of the peasantry, apathy to the plight of the peasantry, and general mistreatment of the peasantry were among their many ‘infinite pains’ to raise an evil spirit. 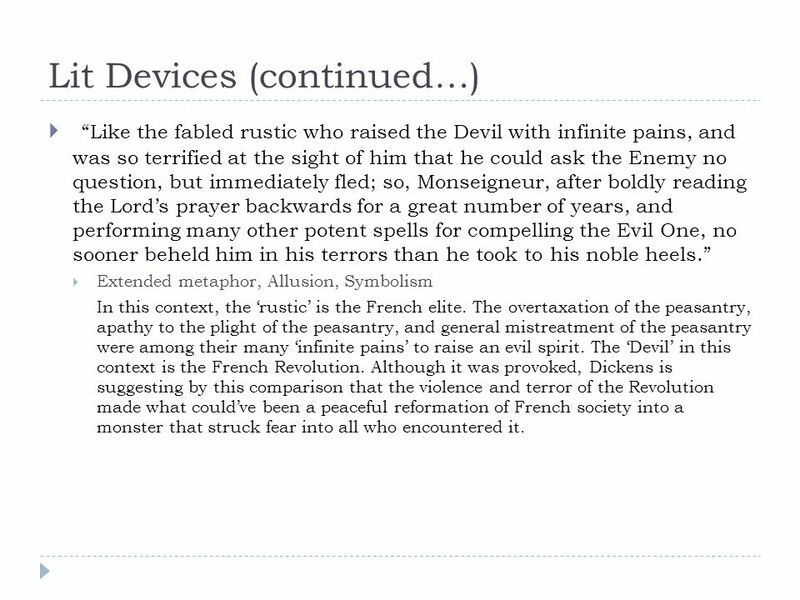 The ‘Devil’ in this context is the French Revolution. Although it was provoked, Dickens is suggesting by this comparison that the violence and terror of the Revolution made what could’ve been a peaceful reformation of French society into a monster that struck fear into all who encountered it. 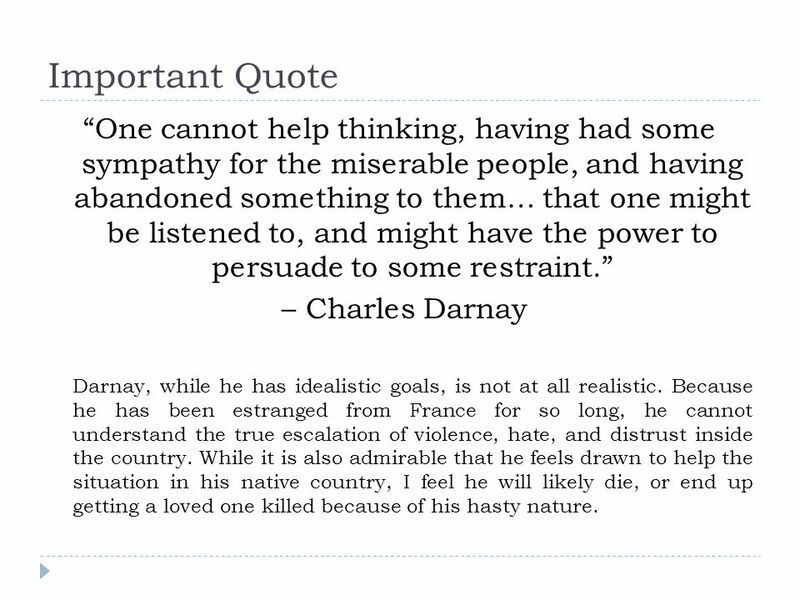 7 Important Quote “One cannot help thinking, having had some sympathy for the miserable people, and having abandoned something to them… that one might be listened to, and might have the power to persuade to some restraint.” – Charles Darnay Darnay, while he has idealistic goals, is not at all realistic. Because he has been estranged from France for so long, he cannot understand the true escalation of violence, hate, and distrust inside the country. While it is also admirable that he feels drawn to help the situation in his native country, I feel he will likely die, or end up getting a loved one killed because of his hasty nature. 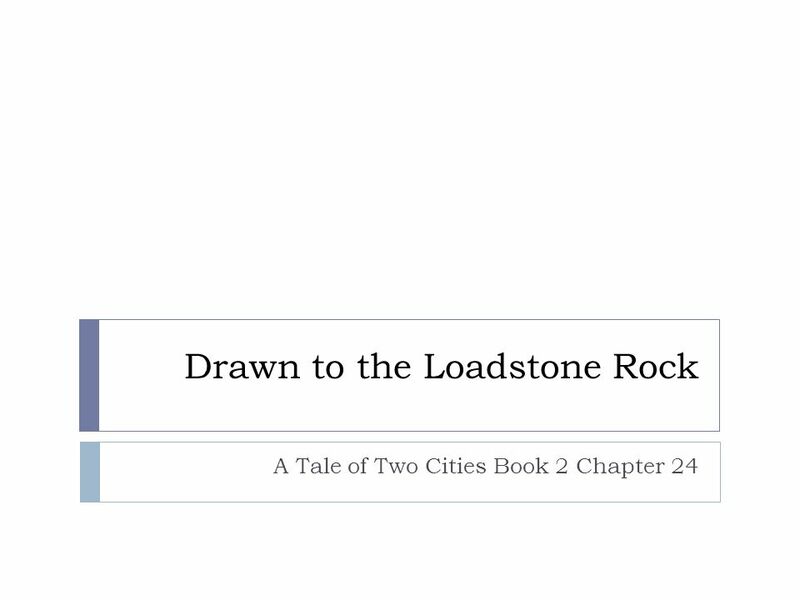 Download ppt "Drawn to the Loadstone Rock A Tale of Two Cities Book 2 Chapter 24." The Pilgrim’s Progress Response to Literature Oral Presentation Chapter 4: In the Valleys of Humility and Death. By: Anna Hart. $200 $300 $400 $500 $100 $200 $300 $400 $500 $100 $200 $300 $400 $500 $100 $200 $300 $400 $500 $100 $200 $300 $400 $500 $100 CharactersQuotes Literary. Book 3 Chapter 11 By: Rachel Ragar.  The definition of dusk is “the darker stage of twilight”  one of the darker chapters of the book. Insights into Book the Second Chapters 10 and 11. The Scarlet Letter Chapters 9 and 10 By: Christopher Hagist. Who are they? Trials and Tribulations Family Matters. A Tale of Two Cities Book 1. Chapters Dickens describes England and France in How does he compare them? (1) Both are ruled by kings who. Insights into Book the Second Chapters 22 and 23. Scarlet Letter Chapters 23 & 24 Cally Farrington Braden Scrivner. Romeo and Juliet. Mr. Shakespeare William Shakespeare: Born in Stratford-upon-Avon, England Became an actor and a playwright in 1592.